The leader of the opposition Democratic Left Alliance (SLD) and former Polish Prime Minister Leszek Miller has described Bronisław Komorowski's election campaign as "anti-Russian diarrhea." Speaking Tuesday on Polish RMF FM Radio, Miller said the anti-Russian direction President Komorowski has chosen to build his campaigning on is a serious blow to Polish-Russian relations, RIA Novosti reports. The presidential election in Poland is scheduled for May 10. Leszek Miller said the SLD's presidential candidate Magdalena Ogórek is "standing up to the anti-Russian diarrhea that is affecting the incumbent president and all of the right-wing politicians." His words echoed Ogórek's interview to the Polish weekly Wprost, in which she accused Komorowski of "not fulfilling his obligations" and concentrating too much on the crisis in Ukraine. She said the threat of Islamic State is much greater than the perceived dangers of Russia. Speaking during Sunday's Constitution Day celebration, President Komorowski dubbed the upcoming Victory Day parade in Moscow a symbol of instability: "Soon Red Square will turn into an armored square again. The divisions that recently attacked Ukraine in front of the whole world and in front of Poland will be demonstrating their strength." 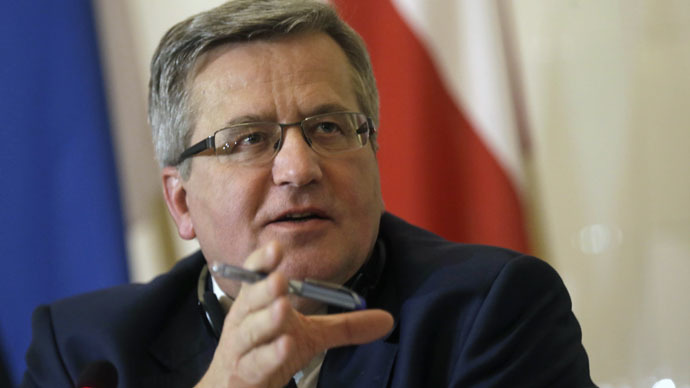 Komorowski called on closer ties with NATO and the West as the only way to stand up to "the threats of the modern world," saying "military conflict has never been so close to Poland's borders." On Monday, he approved the creation of a joint military brigade with Ukraine and Lithuania, a 4,500-strong unit which will answer directly to NATO. At the same time, he called on EU budget deficit limits to be lifted regarding defense spending, to encourage European nations to allocate more money to the military. Poland is among the Western countries that have been accusing Russia of invading Ukraine, something Moscow is vehemently denying. So far, no definite proof has been provided of alleged Russian involvement, and the Ukrainian army's chief of staff earlier this year admitted there was no combat with Russian troops.